Usually I talk about stuff that pertains specifically to computers, but I recently started using a really handy program that will work on computers, tablets and phones (PC or Mac). It’s called Simplenote. For comparison, this is “kind of” a competitor to Evernote. If you haven’t used Evernote, it’s a program for capturing information and storing it no matter where you are or what you’re doing. 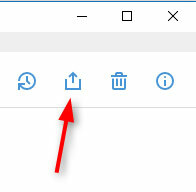 For example, if you see a news article online that looks interesting but you don’t have time to read it at the moment, you can click to store it in Evernote and read it later. It runs on all your devices (including your phone) so you have all your stored notes with you all the time. There have been a few times that I’ve tried to really get into using Evernote because it offers SO much in terms of what it can do. The funny thing is, Evernote has so many “bells and whistles” that it became kind of overwhelming. There is a bit of a learning curve in using it because of all that it does. There are whole books written about how to use it, and Evernote has its own podcast about using it. For some people, it’s more than is needed. And, in order to use all the features, it costs between $35 and $120 per user, per year. Then recently I came across Simplenote. You can get it free at Simplenote.com. It’s free. Using Simplenote really couldn’t be any easier. Just set up a free account at the website, then download the program to your computer. You might use it primarily on your smartphone, but it’s good to have a copy on your computer also. It installs without trying to sneak any bad stuff in. 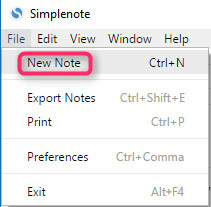 You’ll see “New note” listed on the left side, and the cursor is flashing out in the main part of the window. Whatever you type on the first line will be the name of the note. Everything on the next line and following will be the contents of the note. So far, nothing too exciting, right? I mean you could use good ol’ Notepad on your computer if all you needed to do was make a list. BUT now go to your smartphone and get the Simplenote app (either from Google Play, or from the Apple Store, depending on what kind of phone you have). With the app open, log in to your Simplenote account, and what do you see? Your grocery list, that you created on your computer. 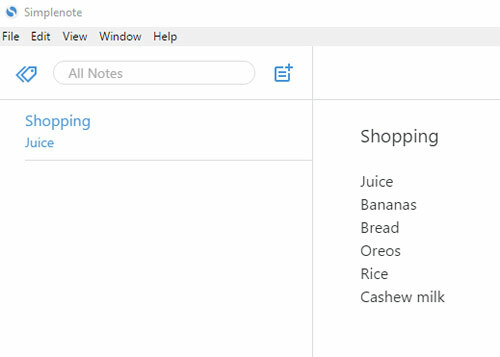 So you can have this ongoing grocery list that you can update whether you’re at home in front of the computer, or out somewhere when you just have your phone. Once I have this list created, there’s something else I can do with it. I can share it. That gives me this new window, where I just enter her email address (the one she used to create her account). Now, that particular note (the grocery list) shows up on BOTH of our phones and computers. And we can each edit it in real time. So if I think of something to add, I put it on the list, and it’s on the list on her phone almost immediately. So each of us always has the most current version of the list. I haven’t been using Simplenote for very long, but I can imagine it’s going to become an important part of my daily routine. What would YOU use it for? 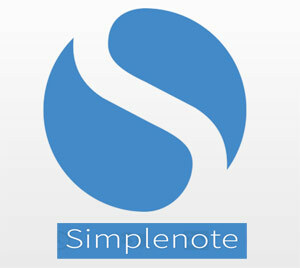 Wow, I’m going to try Simplenote. I’ve got Evernote, but I have pretty simple needs so it can get annoying because it is so complicated. Thanks, Scott! The ability to ‘transfer’ text between PC and phone interested me. However my main PC is XP, and Simplenote does not run on XP. PS I reckon there are quite a few programs that are now like this (not XP available). MS presumably are up to their usual dirty tricks, and are trying to force XP users to upgrade. The way they are doing this, is by ensuring that the Installers for software won’t work in XP (I reckon the programs would work, but MS ensures the Installer won’t run in XP). Rob, Windows XP has not been safe to use since April 2014. That’s a computer that needs to be replaced now.